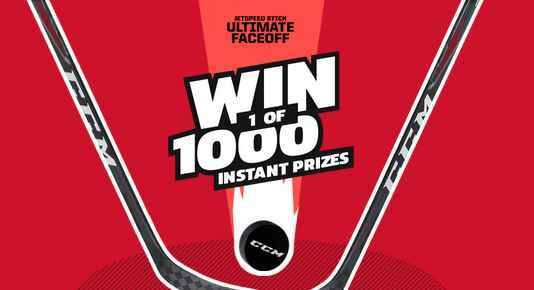 Enter the CCM Hockey Jetspeed Stick Ultimate Faceoff Sweepstakes now for your chance to win a 30-minute meeting with a CCM endorsee to be held no later than November 16, 2018 in Canada or in the United States, two (2) tickets for a hockey game and other instant win prizes such as JetSpeed Skates, Sticks, Gloves and much more. How To Enter: Go to this link:ultimatefaceoff.ccmhockey.com during the sweepstakes period and follow the online instructions to register by entering all information requested on the registration form and once you filled out the entry form now Click on the submit button to complete the registration form. Prizes: One grand prize winner will win a 30-minute meeting with a CCM endorsee to be held no later than November 16, 2018 in Canada or in the United States and two (2) tickets for a hockey game of such CCM endorsee occurring on or about the same date of the meeting referred to above worth $1,000 CAD; Second Prize: Ten (10) pairs of Jet Speed FT1 Skates (ARV of each: $999.99 CAD /$849.99 US) and more. Who Can Enter: This sweepstakes is open to all legal residents of Canada or the United States (excluding the states of Florida and New York) who are sixteen (16) years of age or older at the time they enter the sweepstakes. When To Enter: The Sweepstakes entry begins at 3:00 p.m. Eastern Time (ET) on August 2, 2018 and ends at 10:00 a.m. Eastern Time (ET) on September 13, 2018. Who’s Sponsor: The Jetspeed Stick Ultimate Faceoff Sweepstakes is sponsored by CCM Hockey,3400 Raymond-Lasnier, Montreal (Quebec) H4R 3L3 Canada.